Thank you for visiting Scripture Prayer for Fear and Anxiety. To fully understand the principles of praying scripturally, please read the teaching “Why Pray Scripture?” . Hearing God: As it is rare to hear an audible voice from God, one of the ways God will speak to us is through His written Word and a small still voice inside us. Before reviewing the scripture references below that address what the Bible says about fear and anxiety ask the Holy Spirit of revelation to join you. When certain verses capture your attention more than others, meditate and incorporate those into your personal daily prayer life. Thank you, Lord, that You are my strength. I trust You and I will not fear, for You are with me. If You are with me, who can be against me? I rejoice that You have given me a spirit of love, power, and a sound mind. I give You my fears (name them). Lord, I commit all these things to You that You would establish them and cause my thoughts to become agreeable with Your will. Thank you that You will show me the way out of anxious thoughts and give me courage. 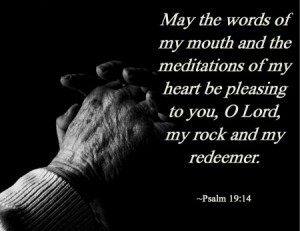 Thank you that as I make my requests known to You with thanksgiving, You give me peace in my heart and mind. You are my strength and my power. In Jesus name, I cast down all imaginations of rejection, failure, worthlessness, and any thoughts that are contrary to Your Word. I rebuke the spirit of fear that would try to torment me and I command it to flee in Jesus’ name. I have been made righteous by Your blood, Jesus, and I can do all things through You because You strengthen me and give me favor and wisdom. I choose not to think negatively or worry about what man thinks of me, but I will think about things that are good and praiseworthy. I will put into practice the things You have taught me, and I will follow Your leading. I will fear no evil for You are with me. You go before me, Lord, and You are my rear guard. You comfort me when I feel weak. Your plans for me are for good and not for calamity. I praise You, Lord, for Your unfailing love and faithfulness. You are awesome and almighty and I am humbled by Your grace. Help me to comprehend Your unfailing love for me, for Your love is perfect and casts out all fear. I want to walk in Your peace that surpasses understanding. Help me to put You first in my life above all else keeping my mind focused on You and Your faithfulness and grace. I submit my life to You, Lord, and I give You the glory for every good thing for all good things are from You. You are glorious and just and I praise Your Holy name. Scripture Prayer for Fear and Anxiety was written to lift up and encourage the body of believers; sharing your testimony is one of the ways that we continue to overcome the enemy. If this teaching on Scripture Prayer for Fear and Anxiety has impacted your life, we invite you to share your testimony.